Posted on February 28, 2014 by Michelle M.
We don’t always get the Cooper’s photos right on the first shot*. Here are some pics that didn’t make the cut. 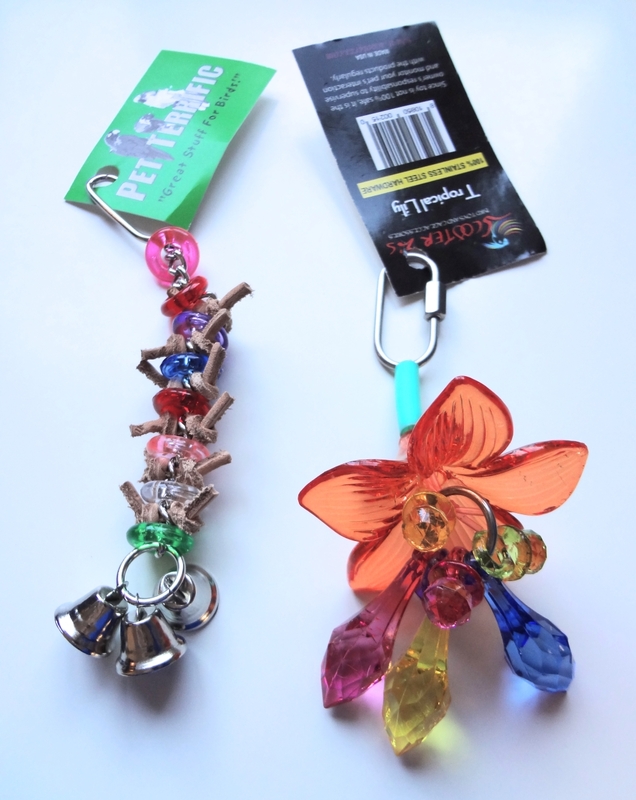 Posted on February 27, 2014 by Michelle M.
Two toys this month – The “Cute Little Toy” from Pet Terrific and the “Tropical Lily” from Scooter Z’s. Here’s Gordie. 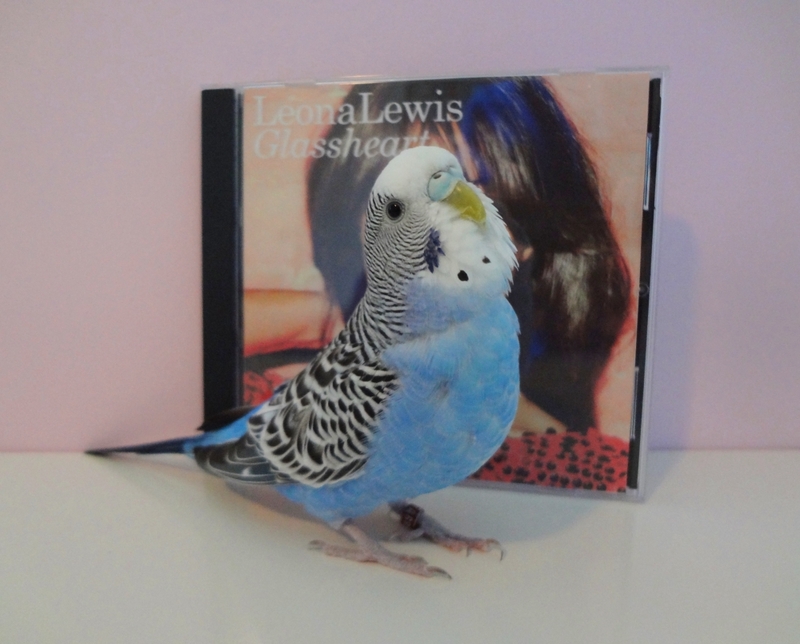 None of the birds have played with this toy yet, but I’m sure it’s just a matter of time. It has knots! And bells! Here’s Ozzie. This is a toy the boys like to talk to. Especially Alfie. He had a long conversation with it yesterday. 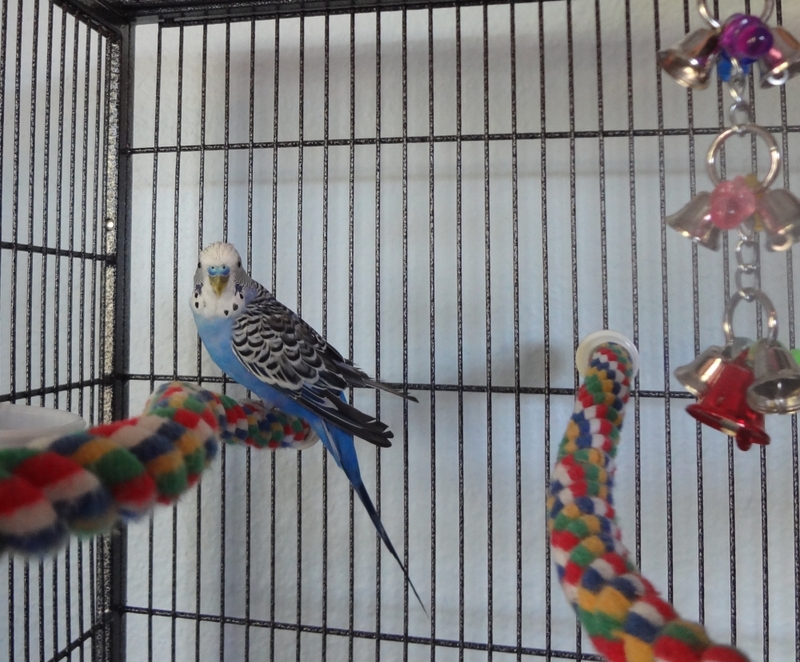 Posted on February 26, 2014 by Michelle M.
Gordie moved into the big cage today. He seems to be doing pretty well. 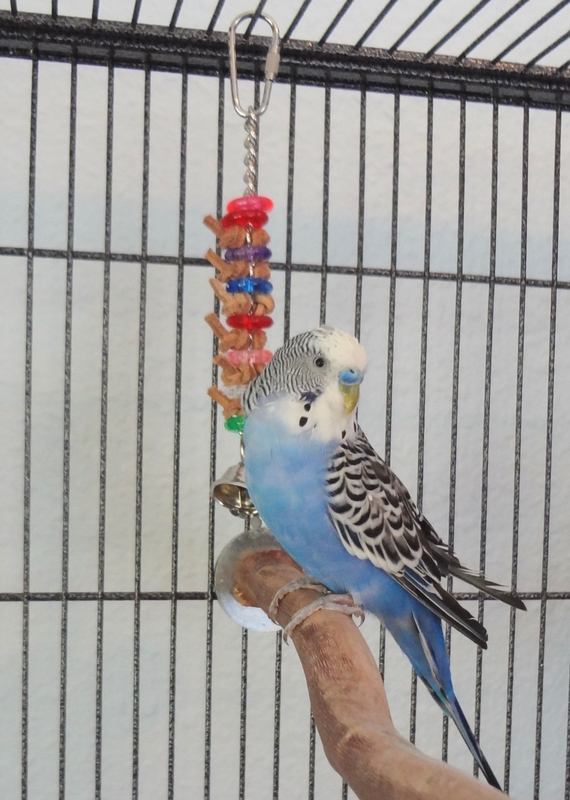 He’s been keeping to himself, but has been chirping and investigated one of the toys. 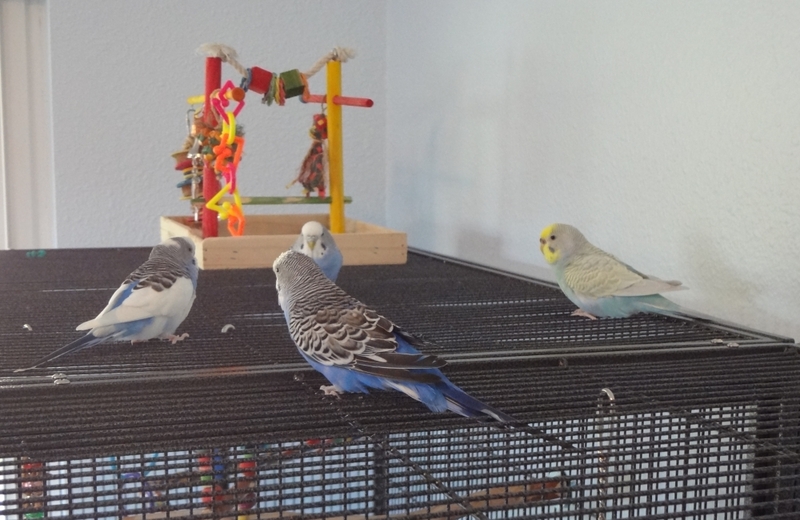 He sticks to one spot and avoids the other budgies, but I’m hoping they’ll all warm up to each other quickly. 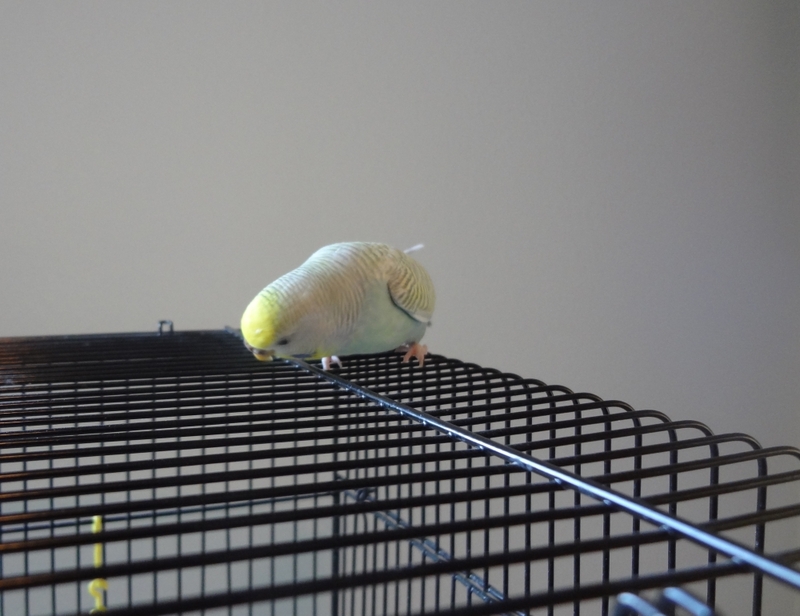 Emmy came out of the cage and bonked into a wall. Eesh. She seems to be doing better flying around, though. It helps to have Ozzie show her how to navigate the room. 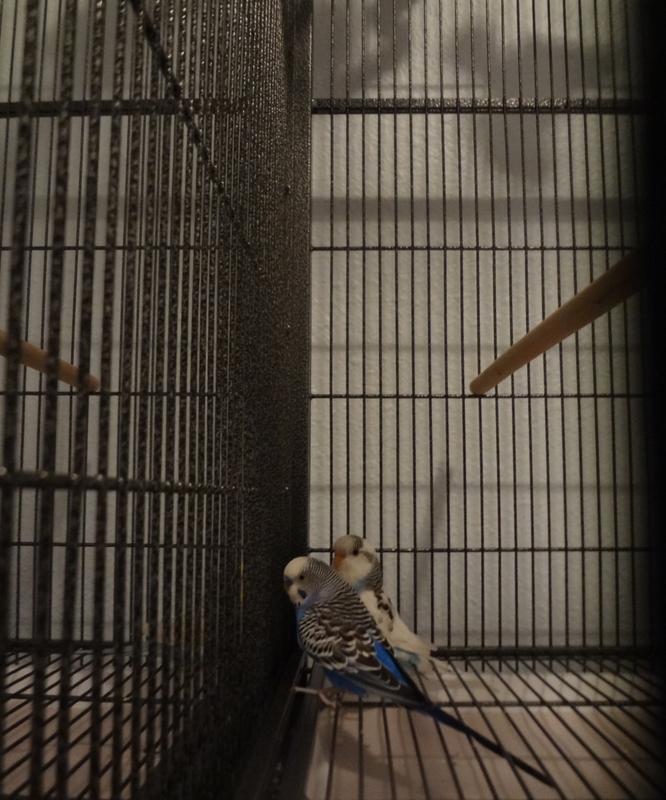 Emmy moved to the quarantine cage. Just until I finger tame her. 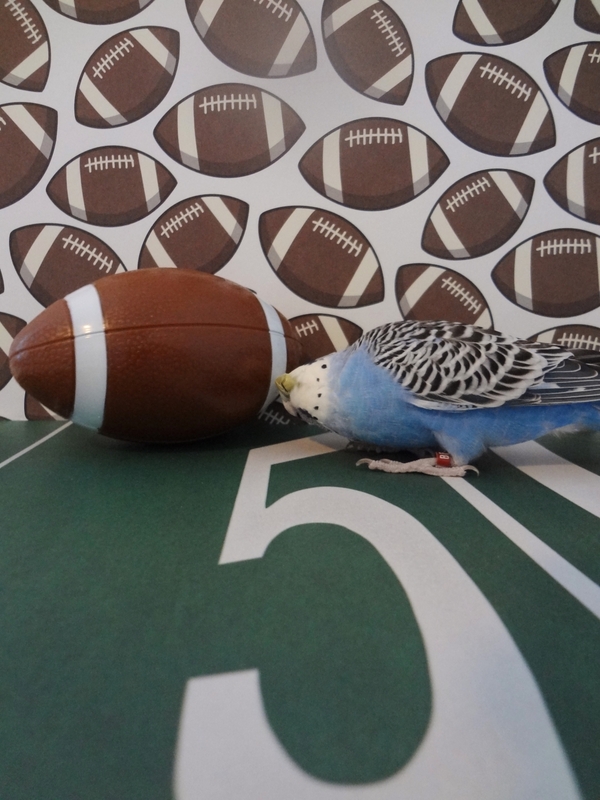 It’s impossible to do in the big cage. Ozzie will visit and sleep there (and show her that stepping up is easy). 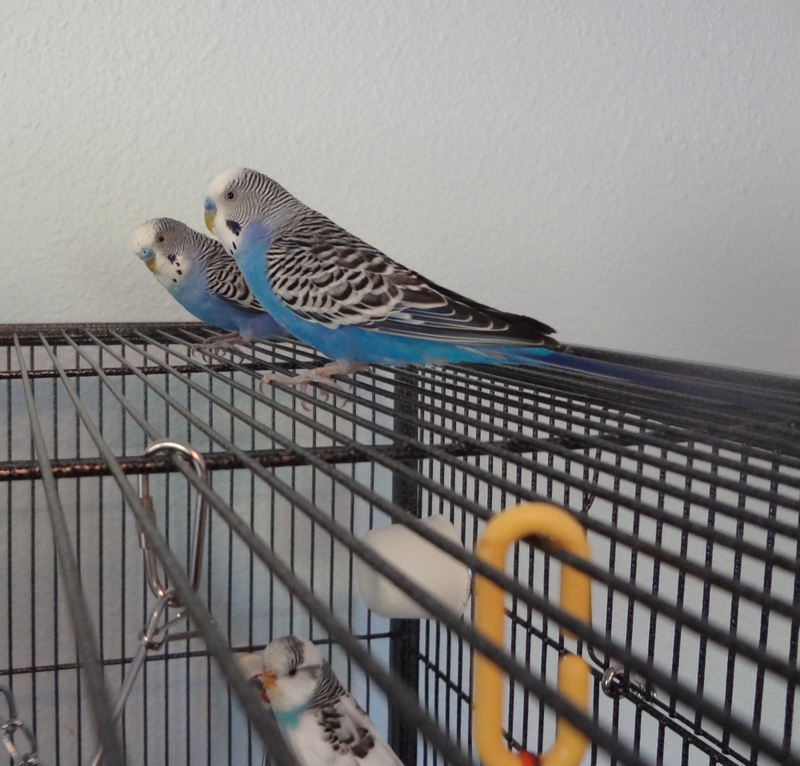 As soon as Emmy moves back into the big cage, it will be Lera’s turn to meet the budgies. 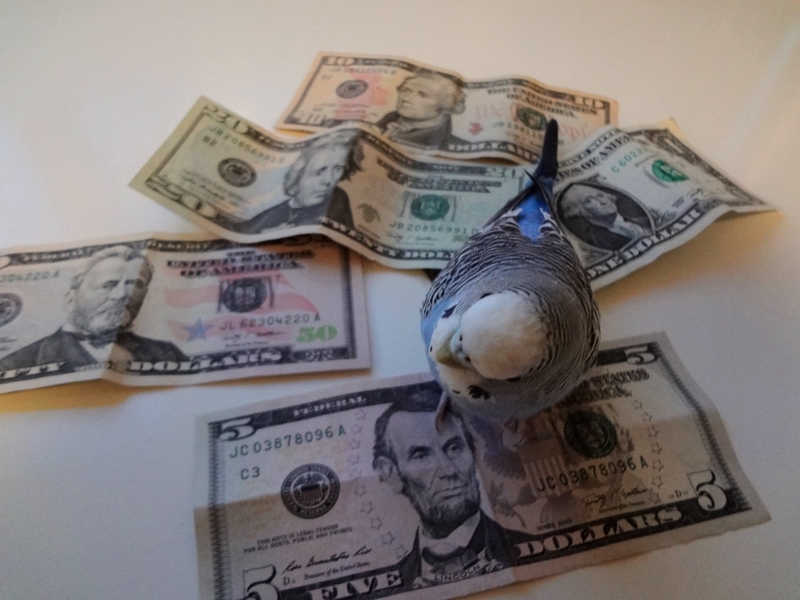 Jeez, we have a lot of budgies! 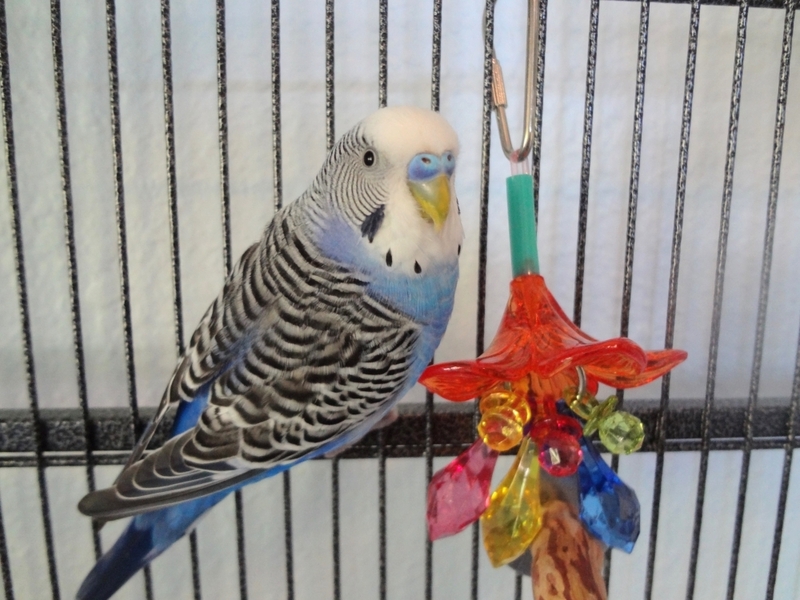 Posted on February 25, 2014 by Michelle M.
Gordie came out of his cage today to meet the budgies face to face. Here he is with Ozzie (that’s Emmy down below). Ozzie was a little aggressive, so we put him back in the cage. At first, Gordie just sat in one spot. Here he is with Alfie. It wasn’t too long before he joined the others. 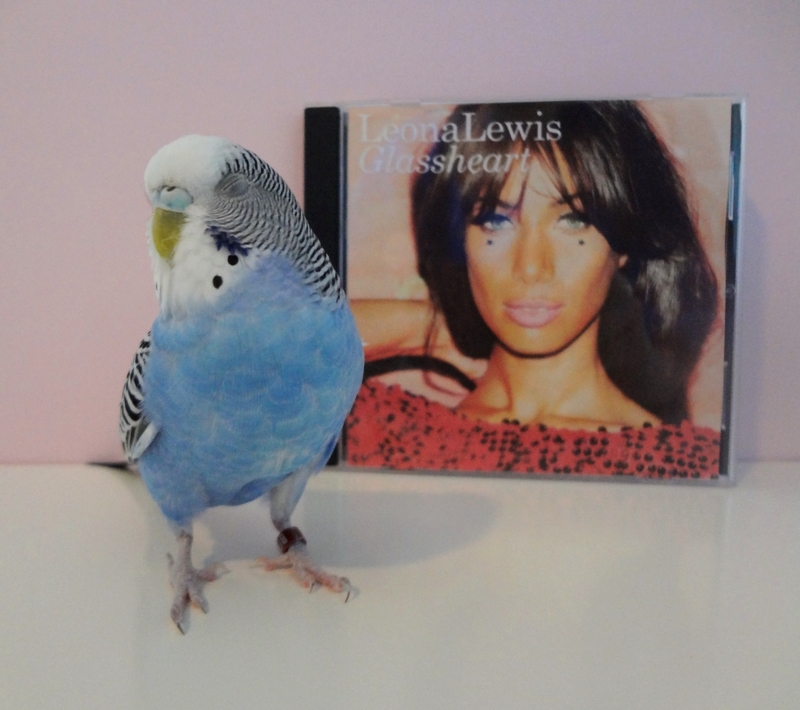 Here he is meeting the girls. 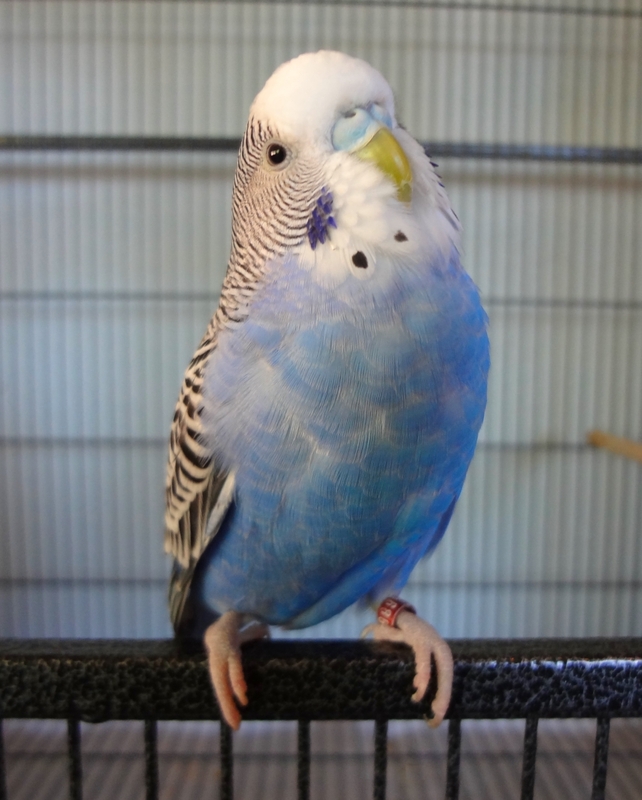 He seemed perkier being with the budgies – following them around and chirping. All the excitement must have tuckered him out. When we put him back in his cage, he went right to sleep. Of course, growing out all those pinnies takes a lot of energy as well! 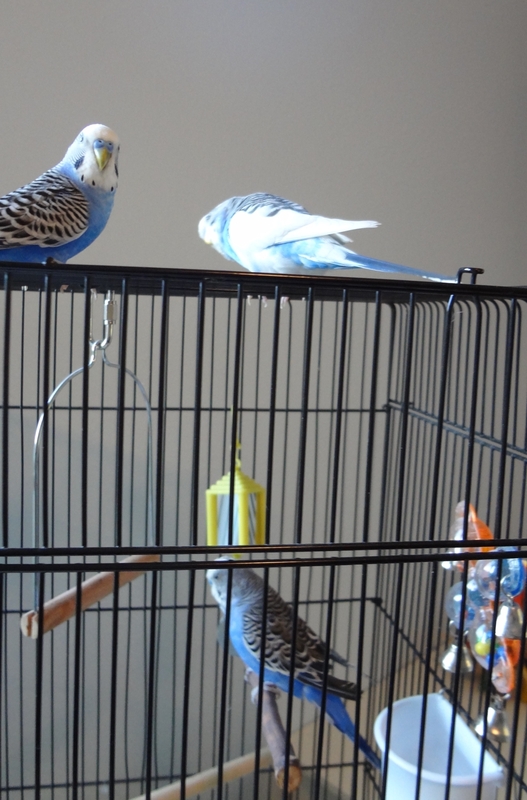 Posted on February 24, 2014 by Michelle M.
We moved Gordie’s cage into the budgies’ room. 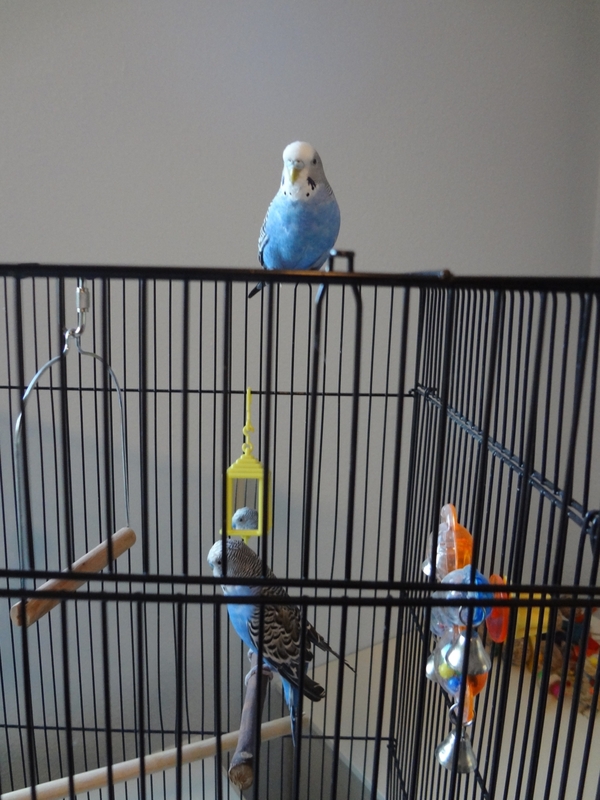 Sunny flew over to check out the new guy. Cooper was next. 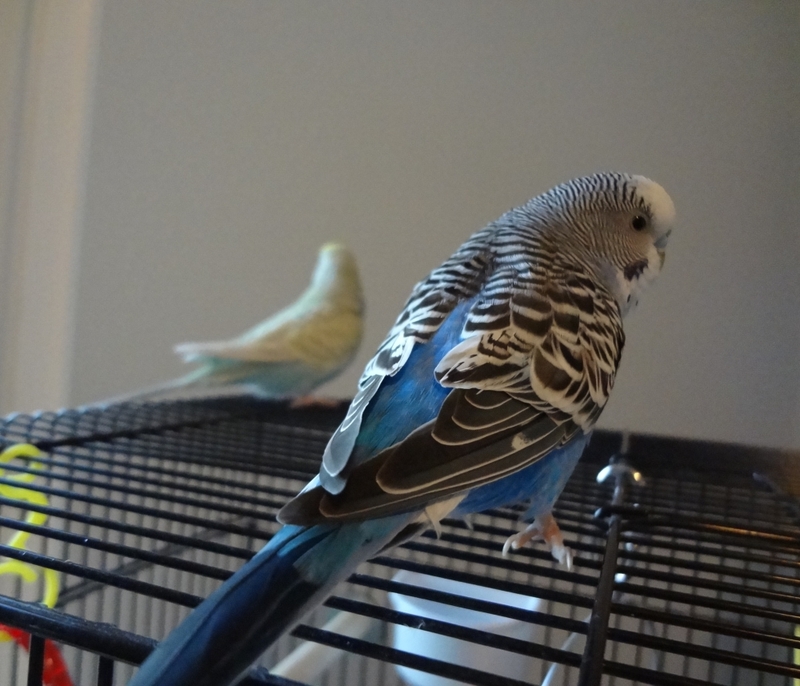 Gordie was pretty calm about all these budgies giving him the once over. The boys (Alfie and Ozzie) finally came over to see what the fuss was about. 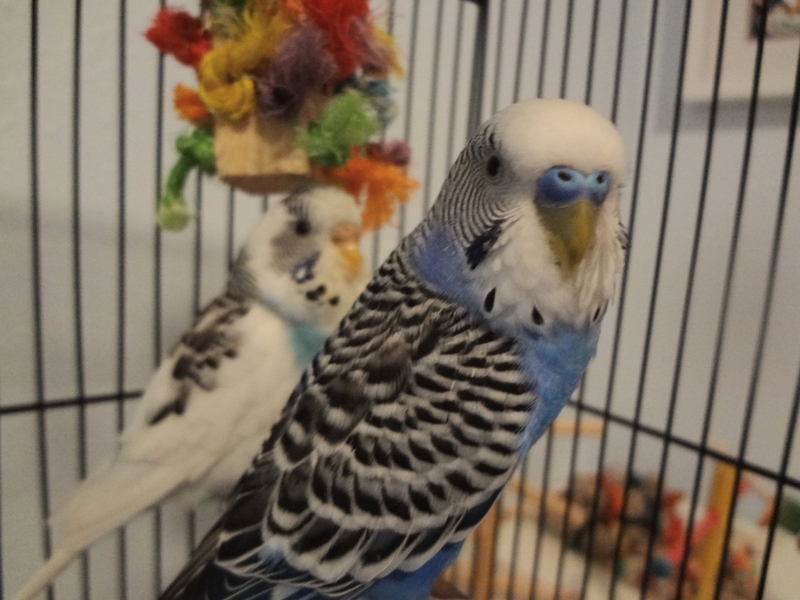 Once we’re sure there won’t be any fighting, Gordie will move into the big cage. Hurray! Posted on February 23, 2014 by Michelle M.
Posted on February 22, 2014 by Michelle M.
These three have been conspiring in the corner lately. I wonder what they’re up to…? 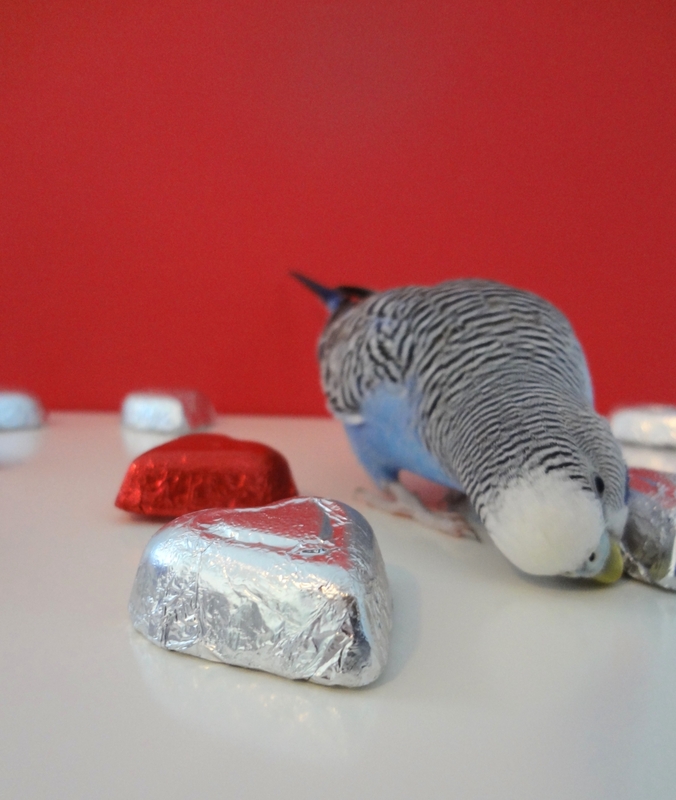 Posted on February 21, 2014 by Michelle M.
Posted on February 20, 2014 by Michelle M.
Cooper and the flock wish all the pets out there a day filled with treats, toys and love! 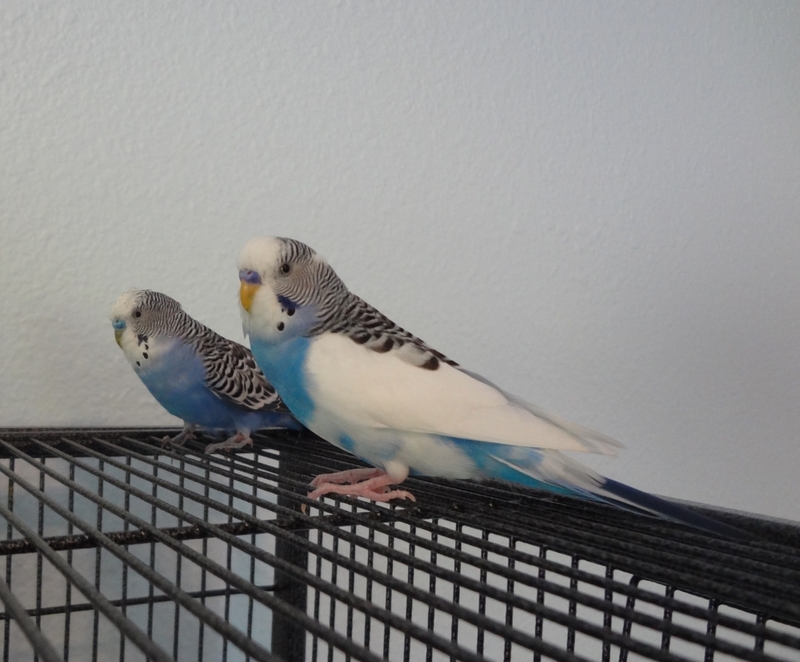 Posted on February 19, 2014 by Michelle M.
A little update on how the new budgies are doing. 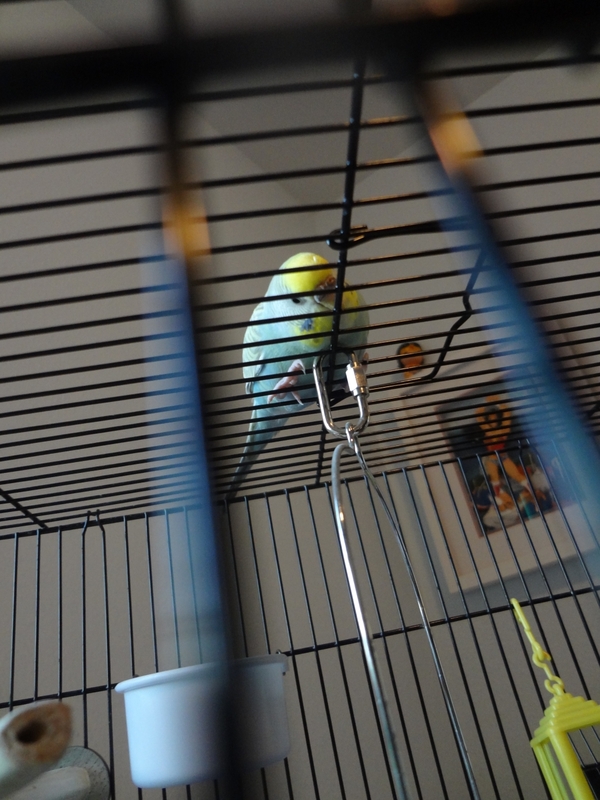 Emmy loves the new cage. She is all over everything. She’s quite the energetic acrobat. She’s definitely going to keep Ozzie on his toes. 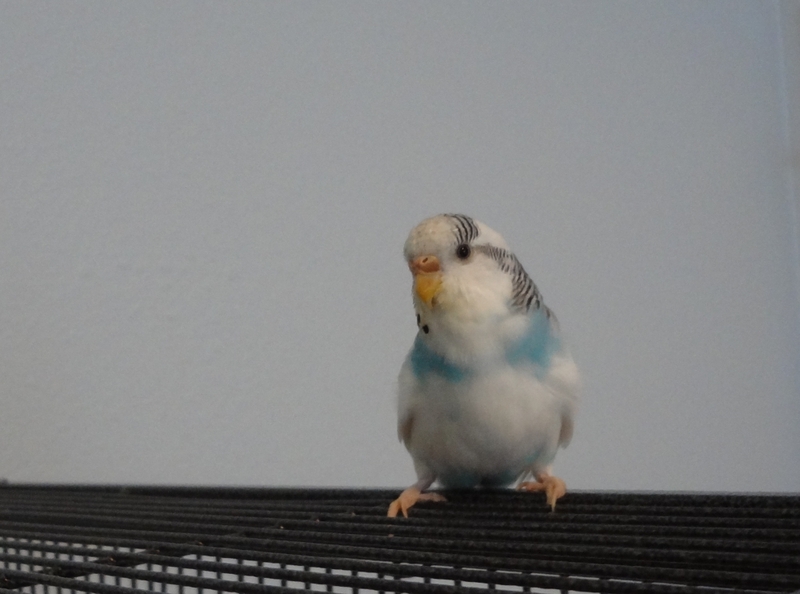 Today she came out of the cage and flew around the room. She bonked into a couple walls. Ack! She’s fine, though. 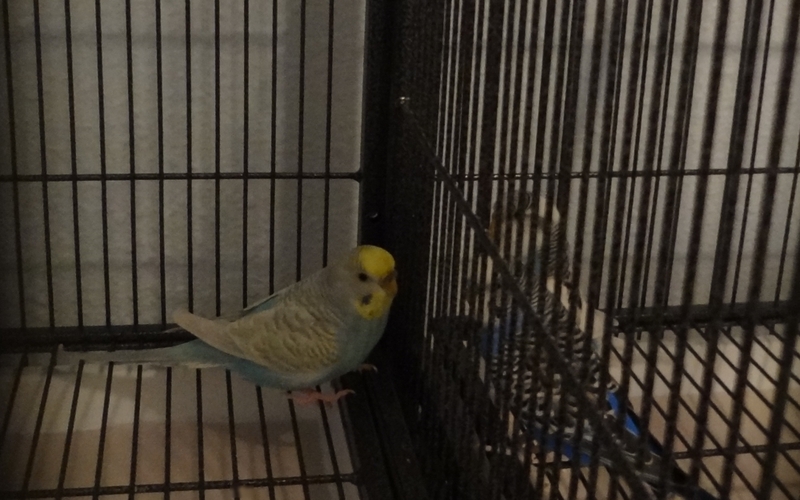 Watching a budgie learn to fly for the first time in a room is awful. Emmy still isn’t finger tame. I need to work on that! Poor Gordie! Look at those pinnies! He’s going through a rather bad moult. 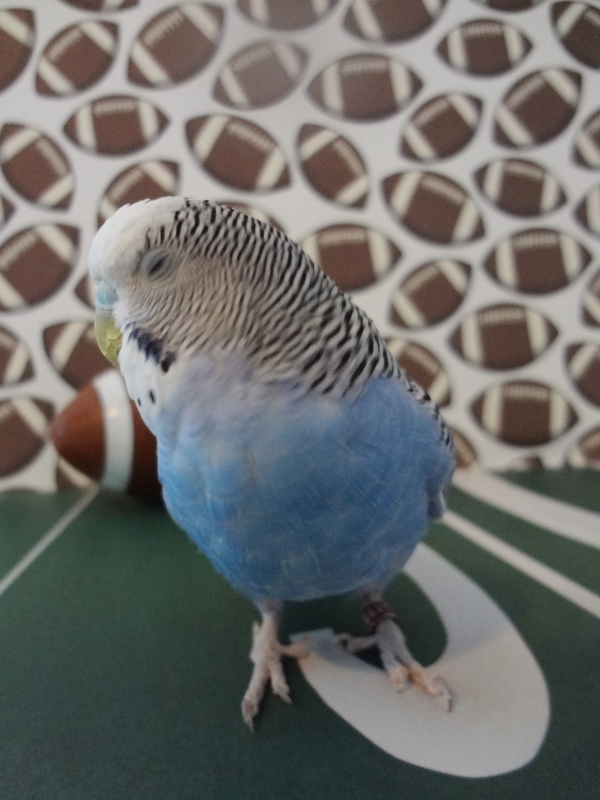 Gordie will be out of quarantine soon. 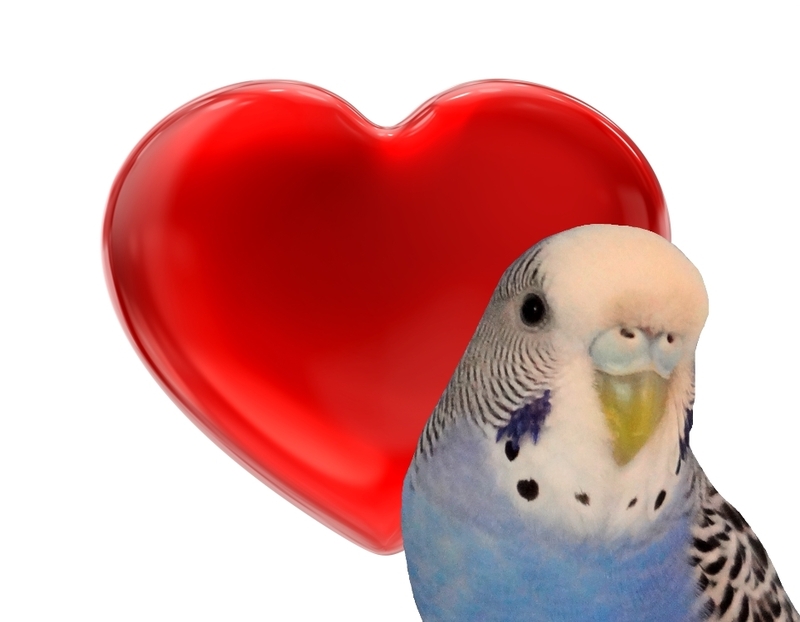 I’m glad he’ll be with the other budgies. He just sits in his cage and doesn’t play with his toys. He’s so quiet. 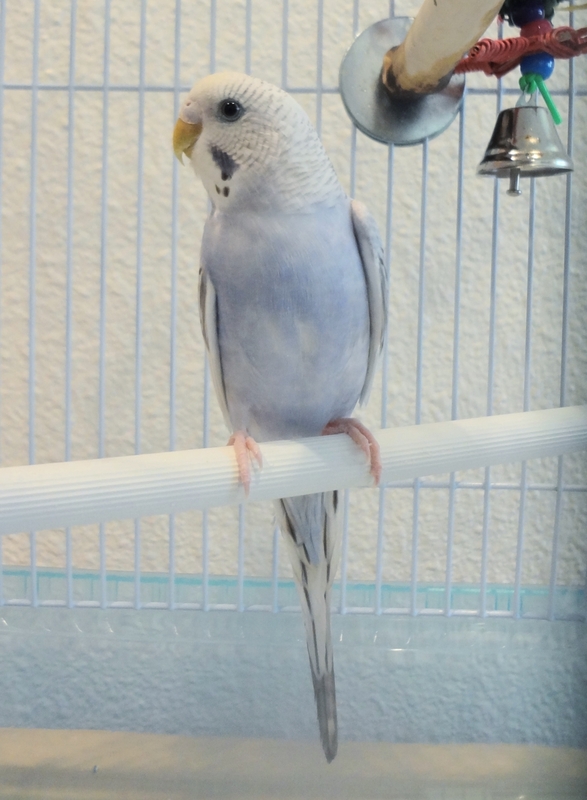 I’m hoping he’ll be happy when he’s part of a flock. Gordie is great at sitting on our shoulders, but does not like fingers. But we keep trying – I think he’ll get there eventually. Little Lera (named after my niece Solera). She’s such a sweetie. Her quarantine will be up soon as well. She lets me pet her tummy, so I think stepping up is right around the corner. 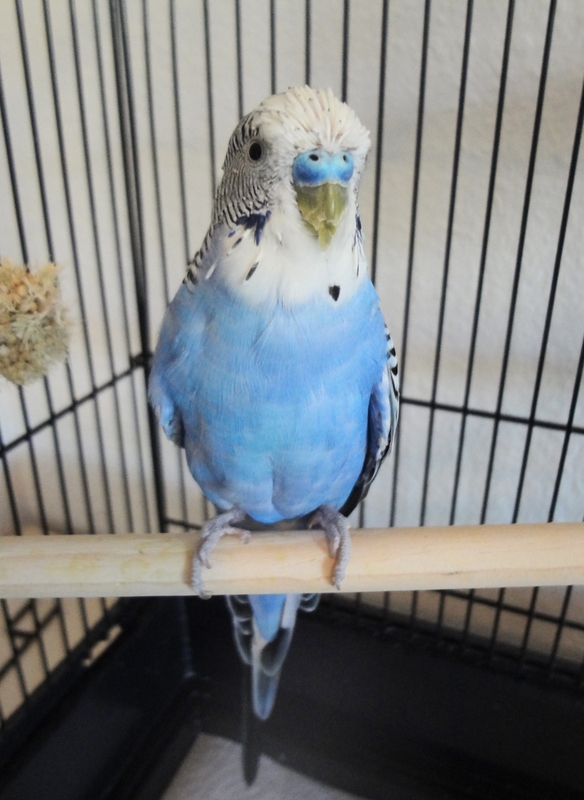 Three days after we brought Gordie home I saw an ad for a budgie in Craigslist. She was in our neighborhood, so I couldn’t resist. She’s just started playing with her toys. 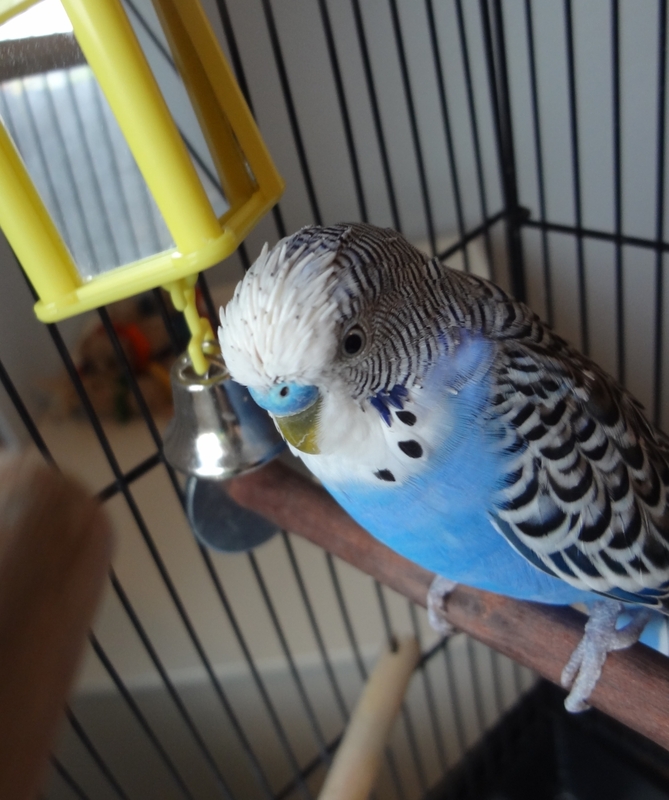 It seems that it takes the rehomed budgies a month to be comfortable (exploring their cage and playing with their toys). 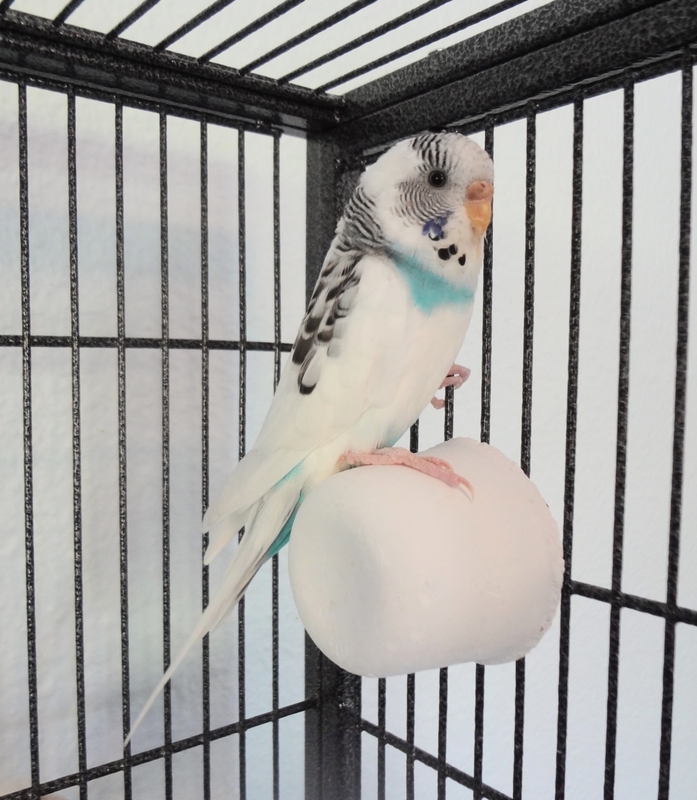 It will be so nice to have all the budgies in one cage. Probably quieter, too!